One thing to also note about Momental Designs – it is a true artist studio. Each item is detailed to include hand-painted details, custom cut sizes, hand-tied bows, and hand-torn edges, just to name a few. Her work really is like receiving a custom piece of art. Ok, and now a bit from Kristy, When Jen first sent through the board I was just giddy with inspiration and admittedly a bit overwhelmed as to how I might reign in my thoughts and create a cohesive collection. 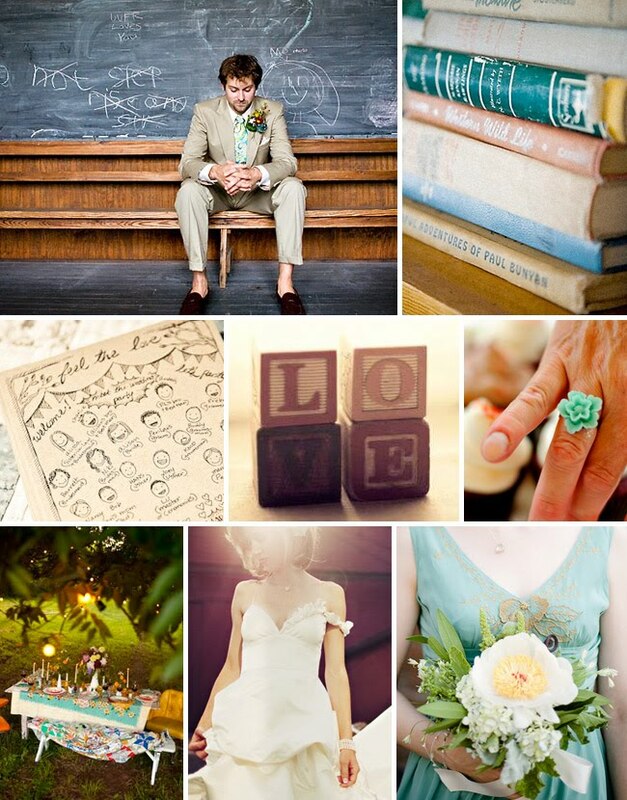 From the super cute picnic at dusk shot to the gorgeous jade flower ring, the possibilities were vast and varied. 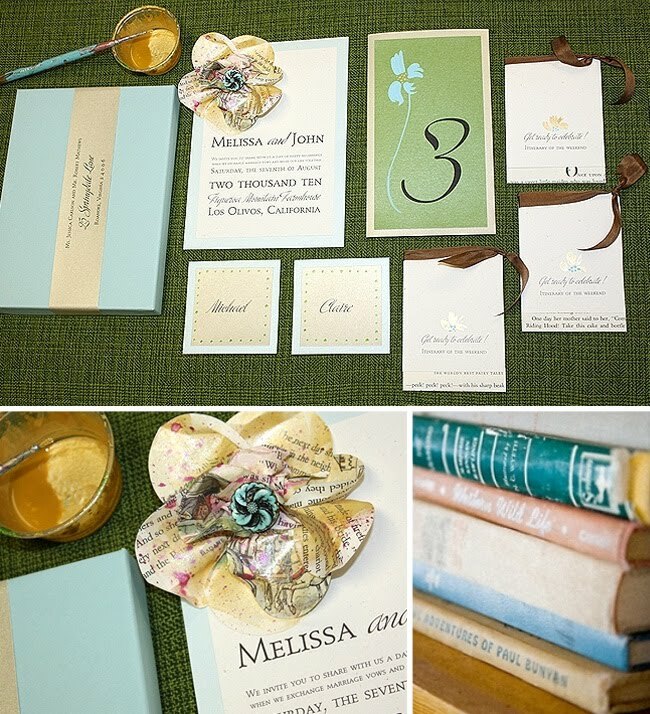 The concept of using book pages began as an attempt to be a bit green with this collection and reclaim/reuse items most brides could find at home. 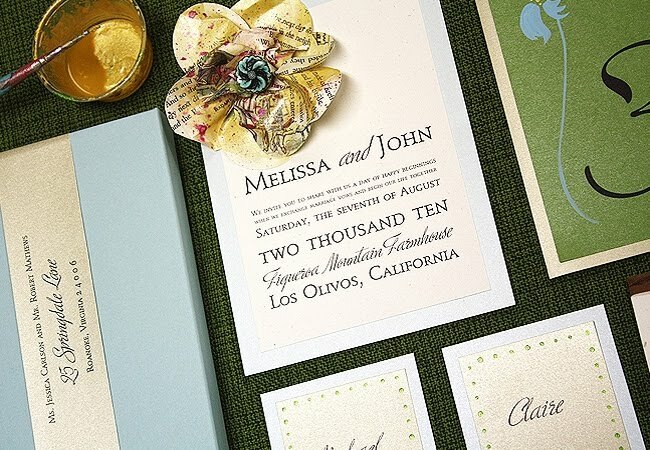 From there the concept grew out of this gorgeous, mint ice cream meets oak wood palette. My Sculpted Bloom is the focal point but not repeated on any other item as to avoid a too cute, overly sweet look. The bloom, crafted entirely from painted fairytale book pages, literally pops off the page and arrives to guests in a paper box, of course! The jade-like medallion as the flower’s center is a find from my button/bauble collection that has been overgrowing for years and probably set me back a mere twenty-five cents. Color use was so important since, in my opinion it could be really easy to go too matchy-matchy, if ya know what I mean. The icy blue/greens were important but the less obvious warmth and glow that gives this board it’s charm deserved to be expressed hence my shimmering gold cardstock and brushstrokes here and there. The simple bloom silhouettes painted on each itinerary and table number were a quick, freehand technique where speed is key to capture the breezy, effortless look of the flower. I am obsessed with painted dots lately so these little gems found their way onto the flower centers and hand painted borders of the place cards. Thank you so much Kristy! It’s fun to see how other people interpret a mood you were trying to create. 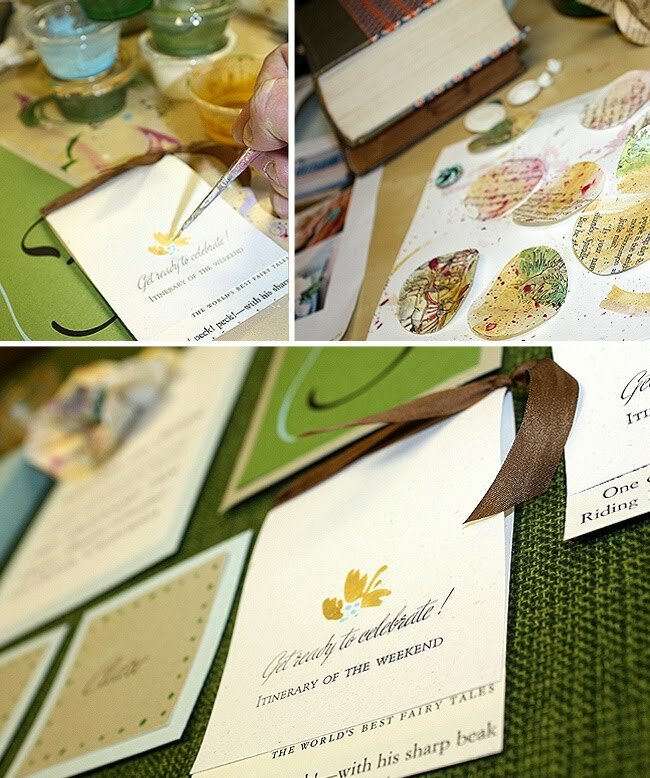 Kristy has two more sets she created from my inspiration boards that I will be sharing over the next few weeks. Be sure to check out more from Kristy on her site Momental Designs. breathtaking and fun … timeless yet qwirky … love it! Aawww, the "Sculpted Bloom" looks pretty cute. 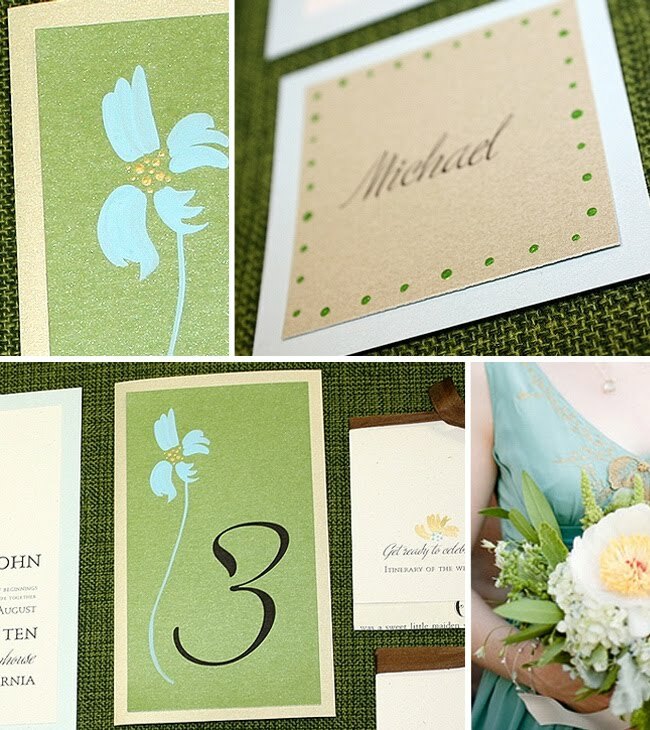 Love the combination of pastel colors and different styles and designs of the invites. I wish I could do something like this.Truly, a fine work of art!! !Love em' all! everything is so pretty and lovely! I love the fairytale blooms. How creative. It is amazing how you can make a flower out of anything.